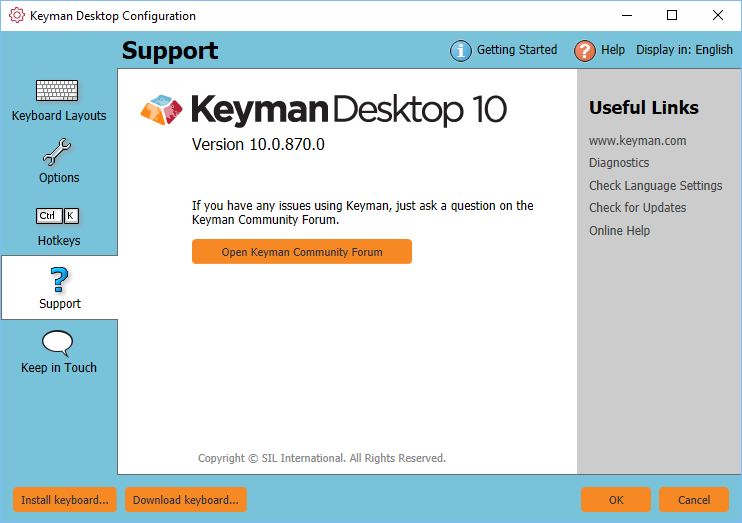 The Support tab of Keyman Configuration displays Keyman Desktop version information and support tools. You can use the Support tab to send a support request, check Windows language settings, check for updates, and view Keyman Desktop version information. You can collect diagnostic information about Keyman by clicking the 'Diagnostics' link under the 'Useful Links' section. The support diagnostic will collect critical diagnostic information from your computer and generate a report. To check for Keyman Desktop updates, from the Support tab of Keyman Configuration click the 'Check for Updates' link. You can also download and install Keyman Desktop again from the Keyman website. Edition — Details on your current edition of Keyman Desktop. Click the Open Keyman Community button. The forums will open in your internet browser. You will need to have internet access for this to open successfully.